Pierre Cardin silver A line ball gown. Silver glitter shimmer fabric with fuller style A line skirt. Features mesh low v plunge neckline with spaghetti straps and embellished detail on waist and back. Elegant choice for your next formal, prom, debs or black tie event. Pierre Cardin silver A line ball gown. 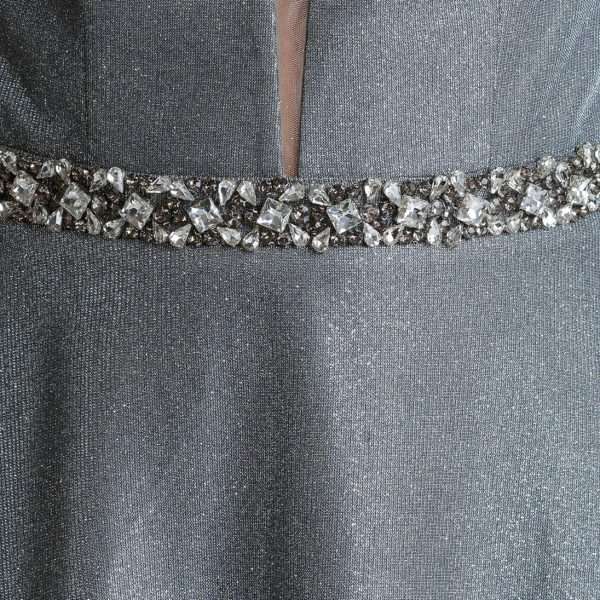 This silver glitter shimmer dress has a real princess feeling quality about it. The fuller A line skirt gives a real sense of fairy tail elegance and is aided with its movement by netted and lined under skirting. The top half of the dress has a mesh inserted plunge v neckline and fine spaghetti straps that cross at the back. The back has a broader embellished detail feature too. 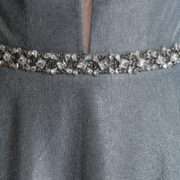 The waist is cinched and defined by an embellished design. The dress has a concealed side zip. An elegant sophisticated choice for your next formal, prom, debs or black tie event.